Keeping a faithful prayer life with your family isn’t easy. From herding distracted children to managing the seemingly endless litany of prayers and devotions, our spiritual life all too often feels frantic and burdensome. This isn’t the way it should be. Our prayer life, our family life, and our work life should – and can! – be in harmony. When they are, our family is a powerhouse of grace, and Our Lord transforms our home into a little Eden – a little bit of heaven on earth. To help you live the liturgical life of the Church more fully, David and Leila reclaim here an almost lost tradition that families used for centuries to build a beautiful bridge between home and church: the little oratory. Consisting of a modest table and icons, the little oratory is a visible sign of spiritual awareness and devotion. It extends the Eucharistic worship of the Mass into the heart of your home, spiritually nourishing your family and preparing them to transform the world through prayer and charity. 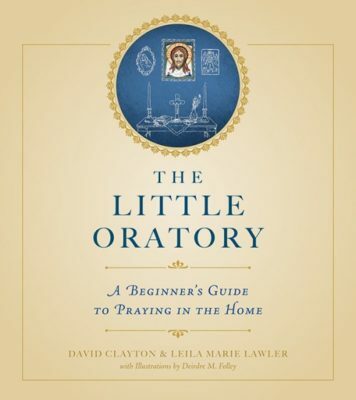 Building your own little oratory is simple, and in these pages you’ll discover just how easy it is. In fact, you likely have most of the pieces in your home already except, perhaps, the sacred art. That’s why we’ve included here seven full-colored icons that are ready for framing, enabling you to get started right away! By following the wise advice in this book, you’ll discover the peace and love that flows from a home that is focused on Christ. You’ll also learn . . .
How to use sacred art to strengthen your prayer life. How to extend Catholic beliefs and devotions into every room of the house. Why the Liturgy of the Hours is important and how it can make your family holy. How to pray the Rosary with children and keep the rowdiest of them calm and reverent. The active role children can and should play in the prayer life of the family. What to do when only one parent takes the spiritual life seriously. How to overcome the feeling that you’re too busy to pray. Practical ways to extend the liturgical life into your workplace.